European made Gumotex inflatable kayaks are made by high quality Nitrilon by 3 to 5 layer combination of high-strength PSEh fabric with minimum tensile strength of 2,800 N (5x20cm), Dtex 1,100. Gumotex kayaks are mainly divided into single and double kayaks with single kayak like Safari has self-bailing bottom and can be used for whitewater kayaking up to level 3. The double kayak Helios 380, won the predicted log section of the ‘97 San Juan Challenge, averaging 3 knots over the 40-mile course in winds gusting to 45 knots. Just recently, the Helios was chosen for a Readers Choice Award from Sea Kayaker magazine in the inflatable kayak category. All Gumotex Inflatable kayaks can be packed and stored in a dry bag or backpack and the weight is only from 7kg to 16kg. A simple foot pump can inflate most kayak in 5 to 10 minutes. 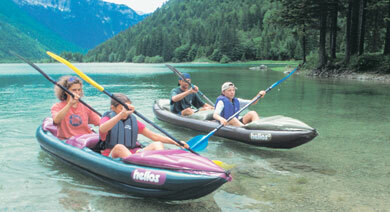 These kayaks can be used from 20 years if they are being used and stored properly.